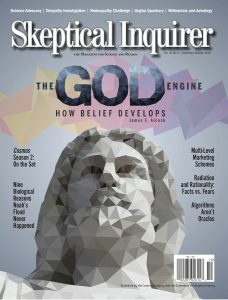 Belief in the supernatural develops as a natural consequence of the way our brains work, so it should be no surprise that religion is both pervasive and enduring. Public attitudes about radiation, shaped by a rich history of mythology from biblical times to the modern events of Chernobyl and Fukushima, impact personal lives and decisions, but they also have global existential implications. Multi-level marketing companies use subtle influence techniques to capture and influence recruits—and you are at risk. I’ve Got Algorithm. Who Could Ask for Anything More? Like the geological evidence, biological evidence demonstrates that a worldwide flood never happened 4,350 years ago, as young- Earth creationists believe. In cryptozoological terms, the Jersey Devil doesn’t have the cachet of the Loch Ness monster, Bigfoot, or even the chupacabra. CAM exploits patients, including physical damage, mental distress, financial loss, and harm to third parties.